Barbara lived in Australia and London before settling in Idaho. She and her husband Tom, who's American, live in their Boise East End home. They share their backyard space with a skunk, several deer and the occasional cougar. 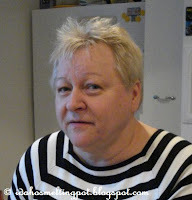 I met Barbara a couple of days before our interview and asked her what she would be cooking. "Lazy Kluski" she said, without really explaining what those were. "I'll make lazy kluski. Tom is excited because I have not made them in a while and he loves them, so that's what I'll be doing." I could see Tom in the background with a grin on his face and nodding his head. Almost as cryptical as the name of the dish itself, Barbara mentioned right before I left that she'll "be making the cheese this weekend, because we will not have time to make the cheese and make the kluski both in one evening." When she said "roll" she demonstratively made a rolling movement with both her hands, as if she was rolling a long piece of dough. Okay, so now I knew that kluski were made with cheese and were rolled, but that's all. So when I finally arrived at Barbara's home last Monday evening, I was curious to see what this dish was all about: what are kluski and why are they lazy? Turns out that kluski are a kind of dumpling and they are called "lazy" because you roll the filling right into the dough, saving you the trouble of filling them, like pierogi. "I used to live on this stuff as a young girl". Barbara is standing at the kitchen counter, crumbling up the cheese. Her kitchen is warm and inviting and her predilection for yellow makes the room seem extra bright. "Living in Warsaw, we would eat often at a bar mleczny in the city and I would always eat this." The bar mleczny is a traditional type of cafetaria that was instituted during the 1960s as an affordable way to provide meals to workers. Its name translates to "milk bar" and originates from the predominantly dairy-based items on the menu, although nowadays the selection of dishes is more varied. The concept of the bar mleczny could be considered fast-food, but most of the dishes are traditional Polish fare and require long, slow cooking methods. Simmer the buttermilk on low for up to two hours. The cheese will curdle and separate from the whey. Pour off the whey and drain the cheese in a cheese cloth. 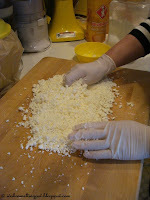 Crumble the cheese into tiny curds. Sprinkle half a cup of flour over the cheese, add the egg and knead to a dough-like consistency. If the cheese is wet, add more flour. If it's too dry, you may want to add a tablespoon of water at a time until the mixture rolls like dough. 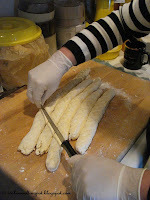 Cut the dough into three pieces and roll each one out on a lightly floured counter. Put a criss-cross pattern on top of the rolls with a knife, then cut into slices. In the meantime, put a pan with water on the stove and bring to a rolling boil. When the water is boiling, drop two to three pieces at a time into the pan, making sure that the boil remains. The kluski will be ready in a couple of minutes and will start to float to the top. Take them out and place them on a warm plate. Panko breadcrumbs work well as they are slightly sweeter than standard breadcrumbs. You can also consider making your own. 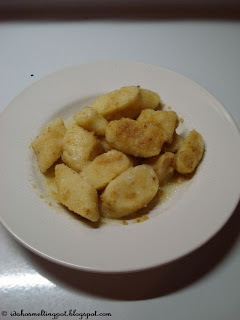 Slowly melt the butter in a frying pan until lightly caramelized, make sure it doesn't burn. Choose a good quality unsalted butter: because of the simplicity of the dish, the quality of the ingredients will make all the difference. 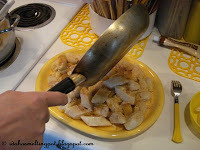 Sprinkle the breadcrumbs over the kluski, then cover with the melted butter. Sprinkle with sugar and serve. Another way to serve them is by omitting the butter and adding a dollop of sour cream instead.